Ileostomy, Oral Rehydration, Electrolytes, etc. Now that my colon has been diverted, I need to make sure that I stay hydrated throughout the day, and particularly after meals. I also have to be wary of electrolyte imbalance, specifically potassium and sodium. Most ileostomy guides provide recipes for various homemade mixes for people who are not fond of Gatorade or Pedialyte. I have a pretty serious aversion to drinking calories so I was looking for low caloric options too. Costco caries Glacéau Smartwater, but at over a $1 per bottle, it's kinda spendy. 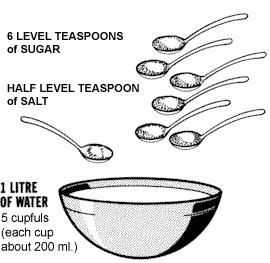 Additionally my understanding is that without glucose (sugar), intestinal sodium (salt) is not well absorbed. Which makes 1 quart of a pretty disgusting watered-down salty concoction. I tried playing around with the amount of juice; It didn't help. Not bad tasting, quite sweet, and very caloric. I tried halving the juice, not bad either, but hardly my favorite. I figured water + salt + sugar would be pretty bland. How wrong was I? I prefer grams since I've never seen anyone being to able to get a teaspoon to weigh the same amount twice. I also use pink (Himalayan) salt because I read somewhere that it tasted better, etc. I'm sure sea salt would be fine too. These articles were published on March 10, 2016.